Have you ever decorated a room and thought, “No, something is not quite right”. You have all the fabulous furnishings and the right colors and the perfect accents but your room is still off. There is one element of decor that is so so important and unfortunately often overlooked. Today let’s talk about the importance of TEXTURE in decor! Texture plays such an important role in elevating your rooms to be perceived by your brain as something beautiful. When texture is absent from decor a room often looks “flat”. In other words not interesting to our brains and perceived as boring. There are so many elements to remember when putting together an attractive room: color, focal point, sight lines, scale and proportion, balance, style, repeated elements, white spaces, etc. And some elements of design are easily seen if not executed correctly. But many of us forget about the magic of TEXTURE! Texture, by my definition, is the ability of our eyes to take in things around it and our brains to translate how those things feel. Texture is how something feels and we really don’t even have to touch it! What a difference! There are many reasons the rug made such a difference. But one of the main factors is this bumpy but soft rug added so much texture! But texture is not all about bumpy things. It’s about feeling all sorts of surfaces. Hard, soft, furry, silky, shiny, smooth, rough, abrasive, downy, chunky, embossed, ragged pleated, thin… you get the picture! And here’s the secret… we need to try to mix different textures into our rooms so our eyes are excited to travel from one texture to another so our brain says, WOW THIS IS SO INTERESTING without it getting overloaded! Learning how to add different textures to a room might take a little bit of practice. Try adding and editing texture and each time you do snap a picture. Then study your picture. You will be amazed what a picture can tell you that your eyes might miss! I talk about “visual weight” on our podcast Decorating Tips And Tricks often. Visual weight is all about texture. Everything we see our brain “weigh”. Lucite has very little visual weight and a nubby rug like the one in my living room has lots of visual weight. Lots of visually weighted texture makes a room feel much more cozy and warm. Less visually weighted texture makes a room feel sophisticated and and sometimes aloof. furniture- consider the texture of every piece you put into your home. Rough planked bookshelves, smooth wooden tables, and linen upholstered sofas are examples of home furnishing texture. 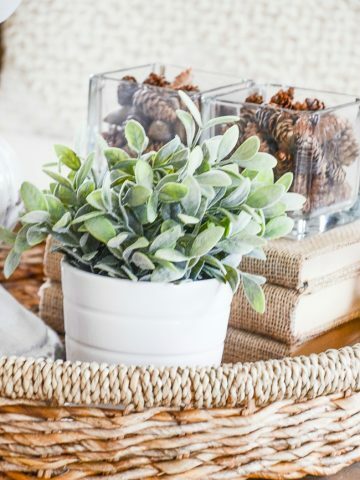 accents- I love accents because here’s where you can easily bring texture into your home. Satin pillows, fluffy throws, smooth candlesticks and rough wooden bowls are ripe with texture! I must also add burlap covered books… my favorite! floor coverings- hide rugs, sisal rugs, silk orientals and wall to wall pile carpet have texture that will add interest to a room! textiles- every piece of material will add some sort of texture and visual weight to a room. The shiner and smoother the less weight and the more furry, bumpy and rough the more weight! wall materials- drywall, brick, shiplap, paneling, wainscoting, stone, marble are examples. Now you know! Look around the rooms in your home and see where you can add wonderful, visual texture! What a difference one element makes. Thanks for the tips! I read your blog everyday. So enlightening! Thank you very much! Hi! 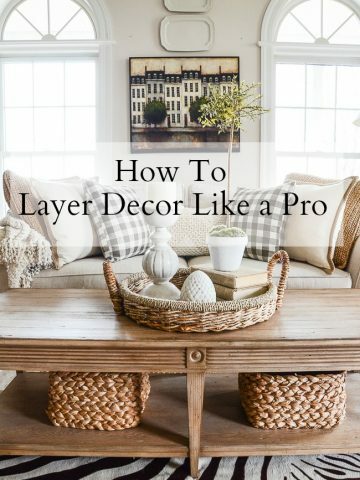 I’m am not a decorator at all and your tips are so helpful! Thank you! Yvonne- I listened to my first Decorating Tips & Tricks podcast with you….. It’s just not the same. I will so miss your voice and humor. Thanks! Those girls will do wonderfully without me full time! Texture…it’s the essential “POP!” BTW: What do you think about a room like yours being done on an angle or the furniture pulled towards the center instead of being along the walls? Is that becoming old school? I absolutely love this post! It’s reinforced the power of texture and the layering of rugs. Thank you for bringing such beauty to so many! I think texture is what my rooms are missing. We’re adding planked walls in the kitchen and I can’t wait to see how that turns out. I think it’s going to really change the entire feel of the room. What is the paint color of the neutral walls on the living room and dining room walls in the Autumn 2017 issue of the cottage journal? Not only does the new rug add texture, THE COLOR unifies the colors in your decor and cools the overall impression of your design. The warm wood floor color fought with the composition. Yet another great posting filled with fantastic advice. Thanks for sharing your beautiful home and insight! love all the texture and the room is great but what kind of tall skinny plants on the coffee table. I love that look. Just added wainscotting to our living room wow!! Great texture. Should my curtains match my paint colour? Wish I could post a picture. I totally agree; texture absolutely makes a difference. 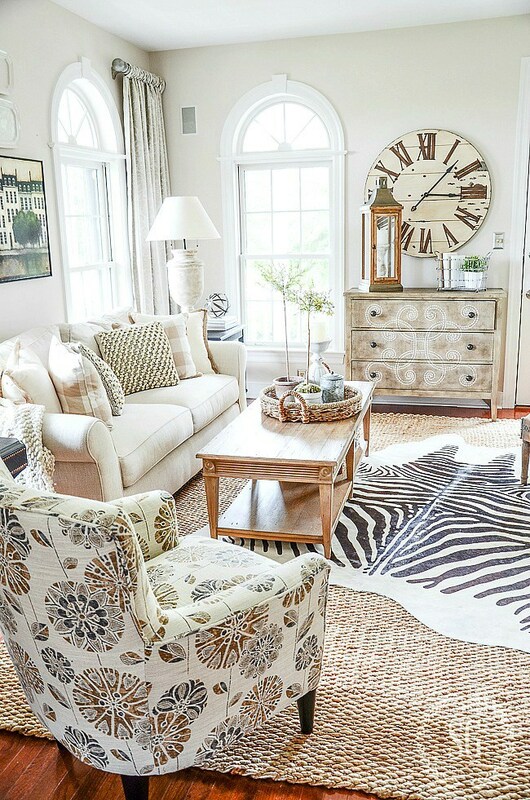 That Sisal rug did make the room come alive, it draws you in. I understand your texture emphasis was on the rug, but what about the pillows? They’re great! Where can I find them? I see what you mean about texture. Someone once told me to look around. Do I have wood? Paper? Glass? Metal? Hard? Soft? But she did not mention texture! In regards to your rug, i liked and still do like the room sans sisal. I also like it with the sisal. I feel like it is two different feels to your room. But I’m not there in person. But gazing at your photos, I love both looks!!! To me the polish of your wood is a texture too! But yes I like the texture of the sisal as well. Great advice, Yvonne! Love your sisal rug. love your jute rug! beautiful! You are so correct about texture, Yvonne! I think texture is one of the main elements that most home decorators fail to think about when styling a room, and it can make or break a design. Another is one of my BIGGEST pet peeves…hanging artwork too HIGH or using prints, paintings, etc., that are too small for a wall space. A podcast on this would be a very beneficial topic, I think. Your textures just pop…to the eyes as well as the fingers! Yvonne your living room is so lovely and cozy. I see a sisal rug in the future. I’m especially crazy about your large leaf plant, please share the name and care, so beautiful. Great post! Texture makes such a difference!! I have made so many decorating mistakes in the past! Wish I had these tips when I was younger. 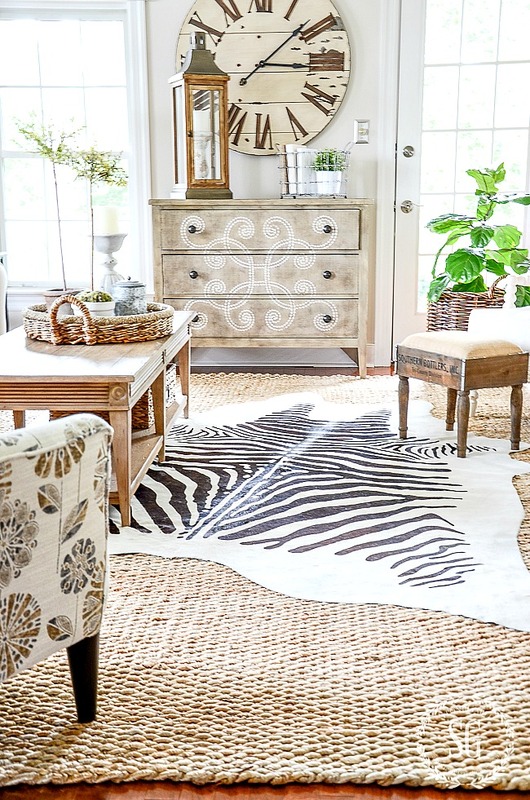 I love the sisal rug…I actually would like to do the same thing in my living room…I have berber carpet in there now that I would like to replace with hard wood, and then place a sisal rug. Right now, a new roof is in the budget? ?How boring, but very necessary. Thanks for the great post! Beth, how about putting a nice sisal rug over your berber for now? Help. There are many sisal rigs out there. Where did you find your soft one?? All I see are scratchy. Thank you. It’s really trial and error for me! This rug is really nice. You can find the link in some of the comments. Totally agree! Texture gives some good depth….we just put hardwood in the dining room….I’m thinking we need a rug to ad a little texture. But I need to convince my husband. Texture is the thing I think I am missing in my decorating. Thank you for this great tip! Wonderful tips! I love the layered look of the rugs. Very informative information. Thank you! 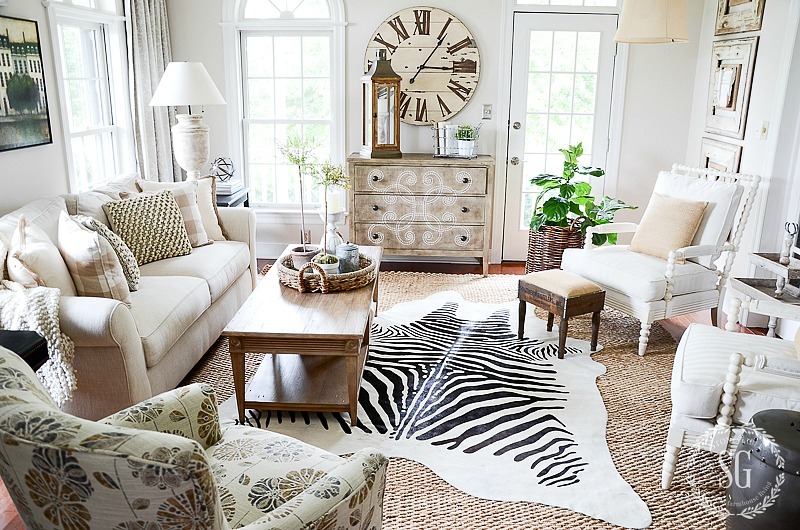 hardwood floors to the open spaces and area rugs.Loving your sisal rug and accessories, very cozy space. I cannot believe the difference th sisal rug made -WOW! From perfection to URBER perfection ! What an informative post!! I never thought about texture intentionally when putting a room together! I must take a look around to see what I have done! 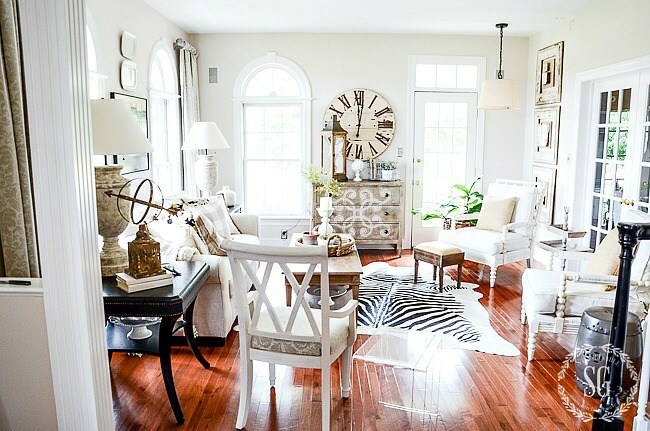 Love the sisal rug! Thanks! This room is beautiful! Where can I find that sisal rug? That’s exactly what I’ve been looking for! Yvonne, your rooms are so comfortable and inviting. Thank you for the insight of adding texture to our rooms. 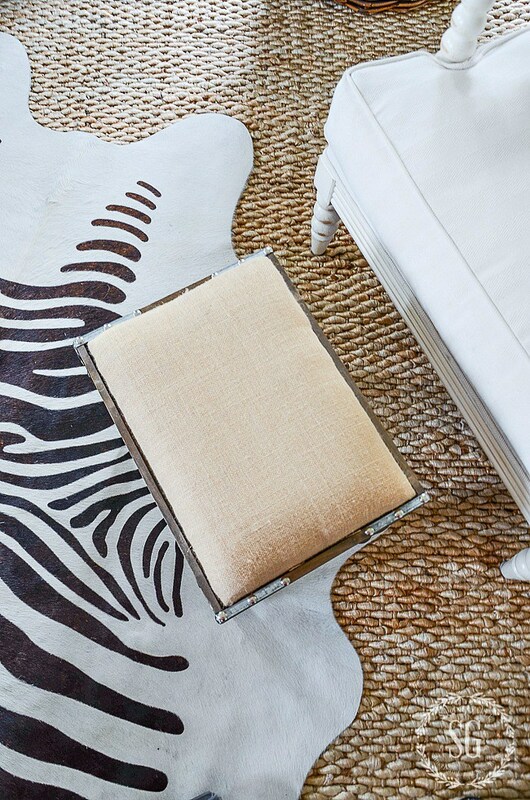 Would you please share the resource for the soft nubby sisal rug? Thank you. The rug made all the difference! Great example. The picture trick is an idea worth trying. That’s often how I know I need to make a change. I’ll see the room in a photo, and something doesn’t look right. Gives you a fresh perspective. Excellent post about texture!!! Very informative!! Texture makes a difference in a room. I try and add texture in accessories and appreciate your ideas. Your rug is great. This information was some of your best yet and the sisal in the living room was a perfect example! Such a simple thing but as you said, sooo very important. Your blogs are like classes of continuing ed. ? Love the large rug in the middle of the room. Had to rethink rugs since my husband now uses a walker so I have had to rethink my rug arrangement. 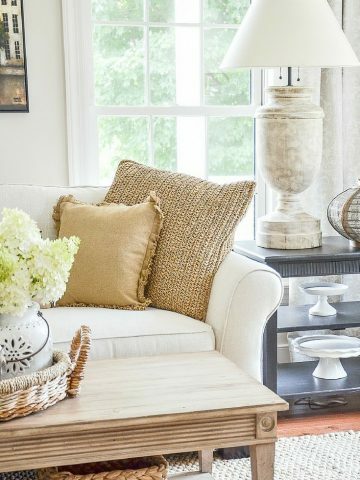 Keep the rugs close to the legs of furniture so he can get around easier and it still adds an element of texture and color that the wood floor needs. You are so right Carol! Think of other areas and ways to add texture! Keep your floors safe! Thanks for these great tips – texture is the key! Amazing how adding the sisal rug made the difference. Thanks for sharing. Happy Monday. Would love to have a sisal type rug in our family room but with 2 cats I am afraid they would quickly ruin it. Too much like a scratching post! Still add texture with pillows, nubby throws, and natural wood accent pieces. I even have a rough linen lampshade that adds interest. Your tips are so on target.Thanks Yvonne. Amazing what a difference the sisal rug makes! 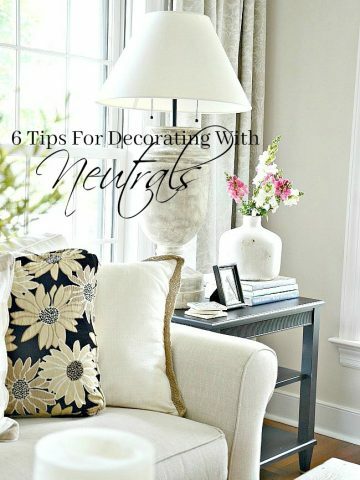 Great post on what to keep in mind when decorating or even putting together a vignette. Love both of your rugs. Thanks for sharing your great ideas!